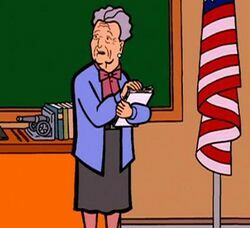 Mrs. Stoller was a substitute teacher hired as a scab worker during "Lucky Strike". She is worryingly senile, believing she's teaching a class full of very large first-graders, marking down Kevin Thompson for not putting his 'real name' of Cubie ("Q.B.") on his paper, and managing to forget Daria was called Daria within a day of making the deliberate decision to call her Darlene instead (Daria sounded like a "hippy name"). To be nice to Jane, Daria writes her a note from "Miss Darlene" to get her out of Stoller's classes. She makes a rare appearance in TAG's "It Slipped Through My Hands, Like a Shadow, Like a Dream", where she's the teacher for a developmentally disabled version of Daria, and Kristen Bealer's "Blood, Sweat, and Cheers", where O'Neill didn't come back after "The F Word". This page was last edited on 14 May 2018, at 15:52.